Use of the digital waybill or e-CMR is growing fast in Europe. Your drivers no longer have to take paper waybills with them on international journeys. A digital CMR is sufficient as a legally valid document in most European countries. This digital document is automatically available in your Trimble telematics solution. 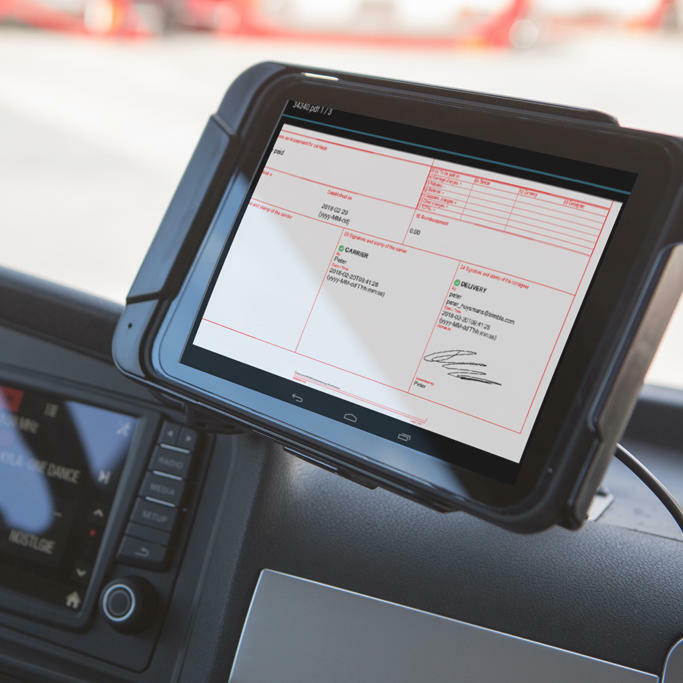 The waybill is integrated into tasks and question paths on the on-board computer. That makes it a lot easier for your driver and administration! 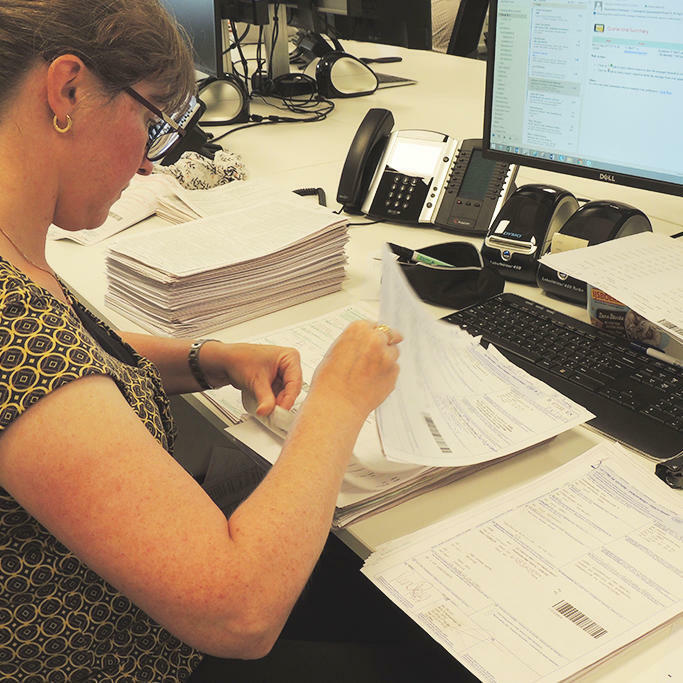 No more paperwork hassle: done with lost, handwritten or unreadable paper waybills. Proof of delivery available in real time: work more efficiently by confirming deliveries fast and error-free, passing on correct delivery times and directly sharing the CMR with all parties involved. Digitizing the waybill means considerable cost savings for your administration and, moreover, it is better for the environment. The waybill is digitally signed and visible in real time in the back office. This way the order can be invoiced immediately. Customers gain insight into the status of their shipments, the timing of delivery, and always receive correct invoices. Exchanging data, signing for receipt or delivery, and tracking the shipment status: everything happens digitally with the e-CMR. Neatly via your on-board computer. The transporter creates the waybill on the e-CMR platform. Together with the task, the e-CMR with unique identification code is sent from the TMS to the Trimble on-board computer. The driver receives the task with the corresponding e-CMR and is able to perform all necessary actions via the familiar question path: digital signature, status updates, adjustments and possibly adding a photo. This way nothing is forgotten. On the e-CMR platform, the completed e-CMR is available to all involved parties in the supply chain. The solution we propose is not a separate app, but is fully integrated in our mobile on-board computer, the FleetXPS tablet. The great advantage is that the driver does not have to perform the same operation twice on both the on-board computer and via an e-CMR app. He can simply follow his familiar operating procedure. The e-CMR automatically forms part of his task. At the office, your employees have all documents and information to share and communicate with your customers. How does the e-CMR integration work? Discover it in this video. Trimble integrates with multiple e-CMR platforms. e-CMR is smoothly integrated in the on-board computer. Drivers and planners always have the correct information about the status of waybills. The digital waybill is signed in no time and available to all parties. The digital waybills are always complete, protected and available. Your customers gain insight into the status of the order and possible changes. Ready to set to work?